Welcome to the June edition of Sarsen Technology’s News Bytes. This month, we have seen a huge amount of activity from our manufacturers, with new products from UEI, X-ES, Conduant and BittWare. We’re also very pleased to introduce our newest product line, Dave. Based in Italy, Dave designs and manufactures a range of small form factor rugged embedded CPU modules and systems, based on ARM and PowerPC architectures. Sarsen Technology has been appointed as the exclusive distributor for Dave embedded modules in the UK and Ireland. Dave, headquartered in Porcia, Italy, was founded in 1998 as an engineering services company, and has since established itself as one of the leading European companies for embedded solutions, offering ARM-based CPU modules, FPGA solutions and turnkey systems to customers around the world. The new relationship will allow Sarsen to reach a wider marketplace and support a range of new projects and applications. 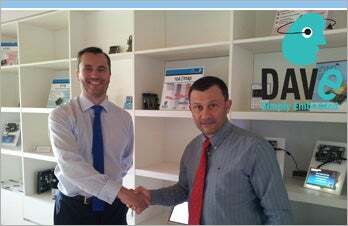 Pictured are Nigel Norman of Sarsen Technology, and Stefano Dal Poz from Dave. Extreme Engineering Solutions has introduced its new family of SBCs based on the fourth-generation Intel Core i7-‘Haswell’ processor. By integrating fourth-generation Intel Core i7 processors into some of the smallest embedded form factors and the most demanding of environments, X-ES maximises the performance strengths of the new microarchitecture. X-ES’s line up of conduction and air-cooled products based on the fourth-generation generation Intel Core i7 processor include the XCalibur4500 6U cPCI, the XCalibur4530 6U VME, and the XCalibur4540 6U VPX modules, which maximise memory capacity and I/O capabilities and add configurability with two PMC/XMC sites. Following the success of their RACK and Cube chassis, United Electronic Industries has introduced the DNF-4-1G FLATRACK™ – a rugged and compact Ethernet-based data acquisition and I/O measurement and control platform in a 1U rackmount chassis. It provides two Gigabit Ethernet (100/10 Base-T compatible) interfaces and four front-loading I/O slots that allow I/O boards to be quickly and easily installed, retrofitted or removed. The slots can be populated from a selection of over 50 I/O layers, including CAN bus, ARINC-429, analog input boards, analog output boards and digital I/O interfaces. The DNF-4-1G is fully supported by all popular Windows, Linux, Vista, and real-time operating systems (RTOS) and an array of application packages including LabVIEW, MATLAB, DASYLab and more. Conduant Corp. has introduced the LTXe storage array for high-capacity, high-density storage in a compact form factor. The LTXe allows easy modular expansion of disk storage via cabled PCI Express (PCIe) providing high-speed connectivity to a host computer for command/control and data recording and access. The LTXe features heater, DC power and rugged options for extreme environments. The optional heater feature enables operation at otherwise prohibitively low temperatures. The DC power option can be used for aircraft or vehicle installations, and the rugged version is designed to meet the military standard 810G (MIL-STD-810G). Units are now available with a 60-day lead time. Following their ISR status announcement, BittWare have introduced their first IBM-based solution, designed for financial and network processing applications. The PCIe Financial Acceleration Platform is based on BittWare’s Altera Stratix V PCI Express boards and IBM® System x® server. The platform provides a fully tested FPGA-based system ready for deployment to the financial industry, significantly minimising their risk and lowering the cost associated with bringing their Financial Acceleration and HFT solutions to market.